"Jack stood charged with cutting and wounding the donkeys with a heavy flail-like instrument. At the request of the magistrate the instrument was put in as evidence. It was produced by the defendant from the depths of a side pocket, and proved to be a switch of about eighteen inches in length. "This is the flail, your honour," said I, “and I own I use it for tickling Tom and Billy, my donkeys. They want no more to make 'em fly." The case was dismissed. 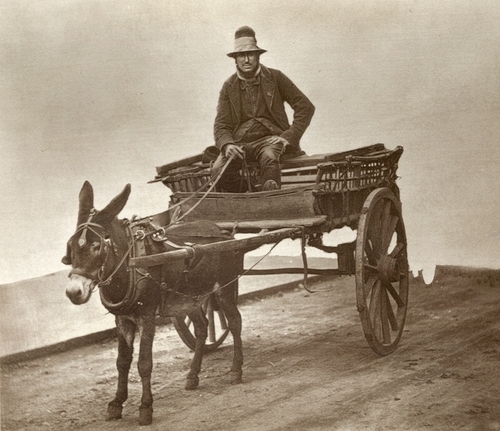 "Jack left the court with a clear conscience and an unblemished name among costers; for, although some of them may neglect their wives and families, it seems to be a point of honour with all to treat their donkeys with kindness. For the kindness bestowed the animal invariably shows its gratitude by perfect docility and willingness to bear the yoke imposed by its master. The donkeys fare like their own masters; a prosperous day will secure for them some dainty, or at least a feed without stint, of oats, beans, and hay, at a cost of eightpence or ninepence."